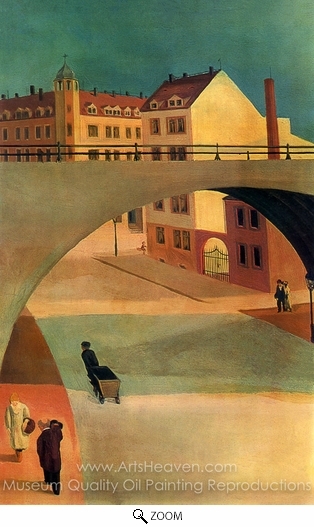 Wilhelm Lachnitt's stunning 1927 painting Bridge is a cruelly underrated canvas from an artist truly deserving of greater attention. Reflective of a cold, icy modernity, Lachnitt's brual concrete crossing cleaves a hole in the town that seems caught between the urban and rural. A vision that could be conjured from an H.G Wells future, and almost contemporary with Fritz Lang's modernist film masterpiece Metropolis, Lachnitt's sterile present occupies the hinterland between utopia and dystopia. The artist's life and works were to crash head-on with the failed utopia of one modernist movement; Nazism. As one of the major exceptional figures in Dresden painting of the last century, Lachnitt began his career in the heady atmosphere of Weimar Germany, before the Nazi era brought persecution and censorship, and before the onset of war and the destruction of the artist's early work. In 1924, soon after finishing his studies Lachnitt joined the Community Party of Germany, the KPD, for which he would produce a number of propaganda images and graphics alongside a number of his Dresden contemporaries. As the political battle for the hearts and minds of the German people was fought between the fascists and the communists, Lachnitt founded a number of associations and artist groups such as the Dresden Action Group and the Dresden Secession. In 1933, the year Hitler came to power, Lachnitt presented his most renowned canvas The Sad Spring in direct opposition to Nazi rule. As such, that same year much of Wilhelm Lachnitt was classified under the notorious category 'degenerate artist', and was consequently persona non grata, and saw his works confiscated. Suffering arrest and brief imprisonment Lachnitt was allowed only to work as an stage designer, being placed under constant surveillance to ensure he did not continue his 'degenerate' experiments. Conversely it was not the Nazis that dealt the final death blow to his pre-war work, but the Allies. In Feburary 1945 the punishing firestorm that resulted in repeated air raids over Dresden destroyed much of his work. 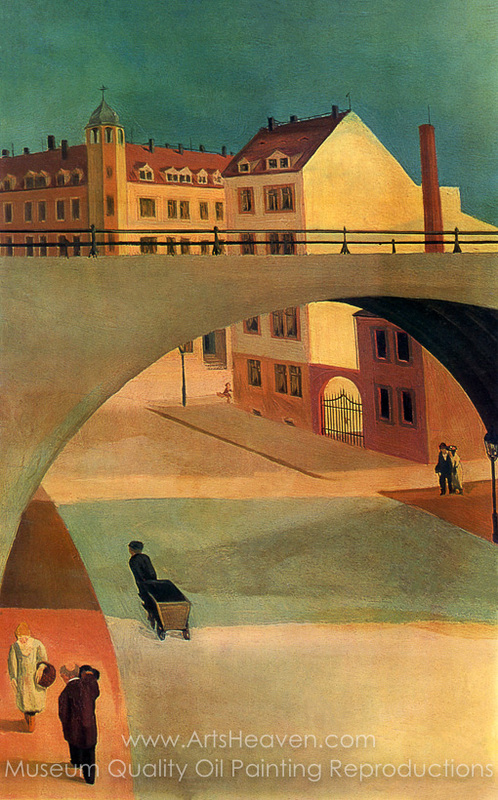 In spite of all this, the artist of Bridge was able to build a career in the desolate post-war environment, being appointed Professor of painting at the Dresden Academy of Art in 1947. Soon after, the unlucky Lachnitt was a victim of the East German system, accused of formalism and dismissed from his teaching post. Continuing to work, the artist transcended the confines of communist East Germany and his surviving work is a testament of the creative prowess of an artist who refused to bow to oppression. Decorate your home or office with our beautiful museum quality art reproduction of Wilhelm Lachnitt Bridge painting. Why settle for a print, poster, giclee or canvas transfer when you can grace your walls with a genuine oil on canvas painting reproductions for sale at up to 75% below gallery prices. You are commissioning an authentic hand-painted oil painting on quality artists canvas. Painted by professional artists brushstroke-by-brushstroke with attention to all details. Order your Masterpiece today and get Free Shipping to your door direct from our studio.